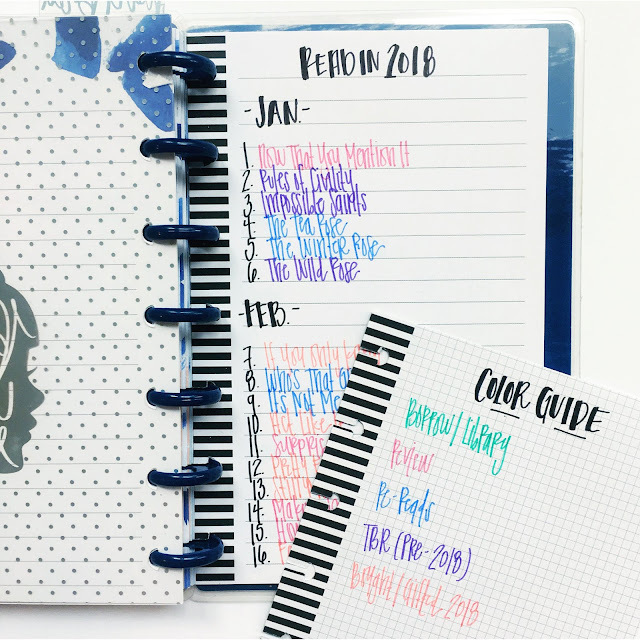 Back in December, I reflected on my favorite things of 2017 and noted that Happy Planner was at the top of the list. I bought my first one that May after seeing Lindsey from Bring My Books raving about them. And though I swore I wouldn't buy all the things, I should have known that I'd be so obsessed with it. It started with sticker books and soon spiraled into making my own printable pages. So, I thought it would be fun to spend this week talking about how I'm using them. Happy Planners come in three sizes: Big, Classic, and Mini. I have one of each, and they each serve a different function. 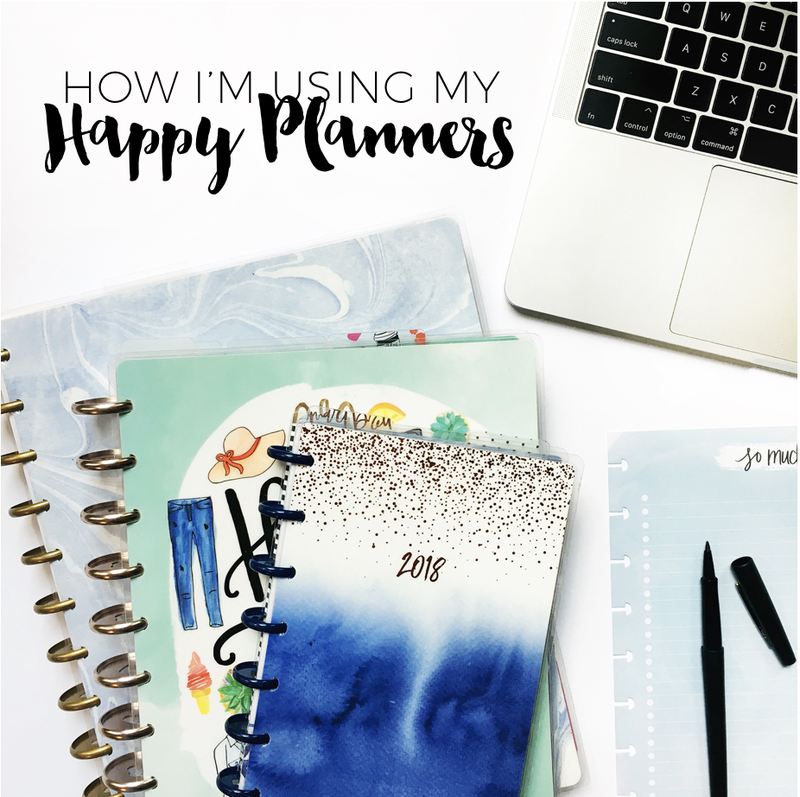 It's time to chat about my final Happy Planner: my mini! I use my mini Happy Planner as a reading journal! I've got a notebook with a list of what I've read each year that I started when I created my blog back in 2011, but it's just a list of titles and authors. I've always wanted to do something more, and that's where this one comes in! I started it last year, so I'm on my second one now. 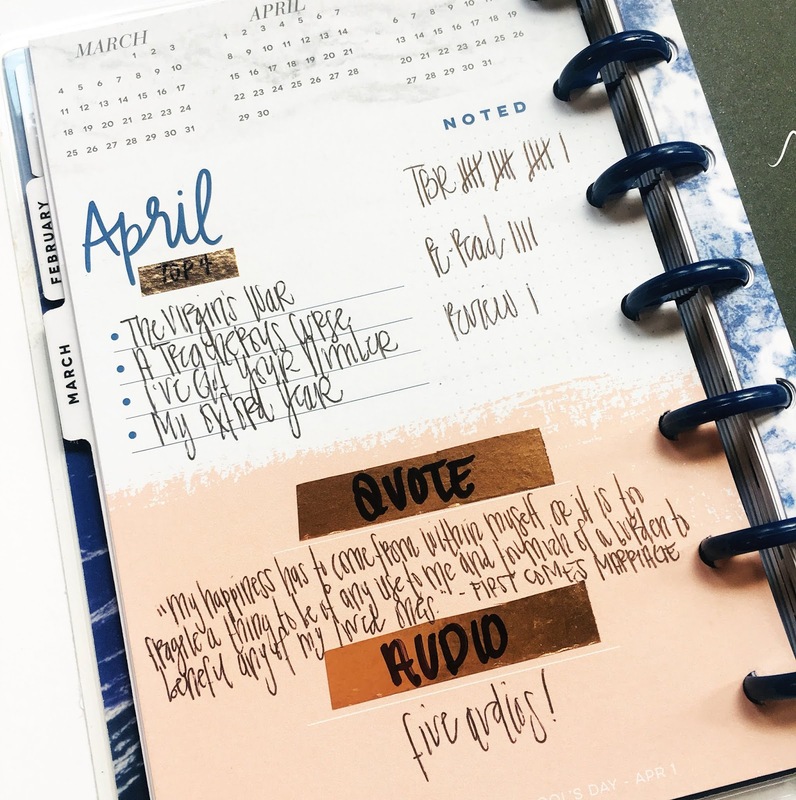 At the beginning on every month in a Happy Planner, there's a recap/overview page. As you can see, I've covered some of the categories with washi tape to make them work as a reading journal. The list underneath April is labeled Top 4, and it's my four favorite reads from that month. Noted is a little breakdown of the source of what I read: TBR, Review and Re-Read. Quote is my favorite quote of the month, and Audio is just the total number I listened to. 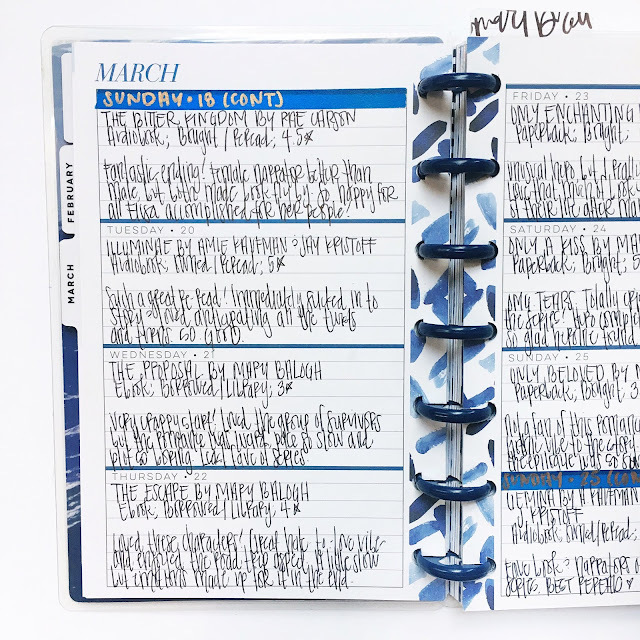 The only thing to keep in mind, if you want to use the mini Happy Planner as a reading journal, is what this page looks like in whichever one you pick. Some minis have versions of this page that are hard to re-label. On the monthly calendar, I write the title of the book on the day I finish it. Last year, I wrote more in the Notes sidebar (like the genre breakdown) but didn't continue it. If I finish two books in one day, I'll draw a line dividing the box in half. It's interesting to flip through and see months with reading slumps versus binges! Mini Happy Planners are all in this horizontal format. It's worked perfectly as my reading journal because it's just enough space for a few thoughts on what I've read but not so much that I dread writing in it. In the past, I've given up on reading journals because it felt like writing a review – and I already do that here on the blog! And that's it! I don't write in complete sentences or try to make it sound nice. It's really just for recording my overall impressions. It's useful for me because I rarely write a review immediately after finishing a book, but it's not hard to grab this little notebook and jot down a few thoughts when I'm done reading. 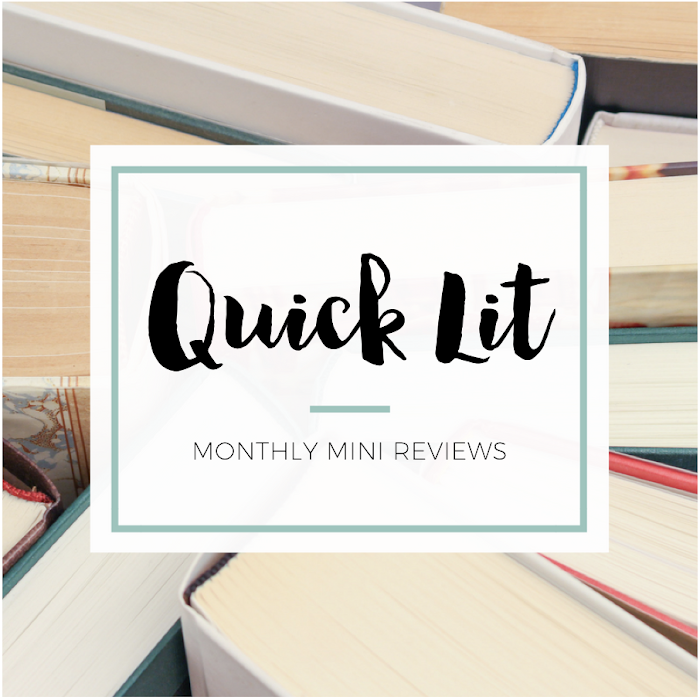 For the sake of this post, I specifically chose a week where I finished a lot of books so that you could see it really filled in. But there are lots of weeks with only one or two books recorded! In busy weeks where I finish more than one book in a day, I'll take a little washi tape and cover up the date of a day where I didn't finish anything and just label it with the new date. That's why you see Sunday • 18 (Cont.) at the top of this page. And if I'm really tearing through books and finish so many that I can't re-label the existing spaces, I'll just stick a sheet of lined paper in the middle of that week's spread. I'll do the washi + Sharpie thing again, and then I'm all set. At the very back of this journal, I have the titles of what I read color coded by the source. That's how I format my Read in 2018 page on the blog, and I just like having a physical version of it. Okay, that's it. I hope you've enjoyed taking a tour through my Happy Planners! 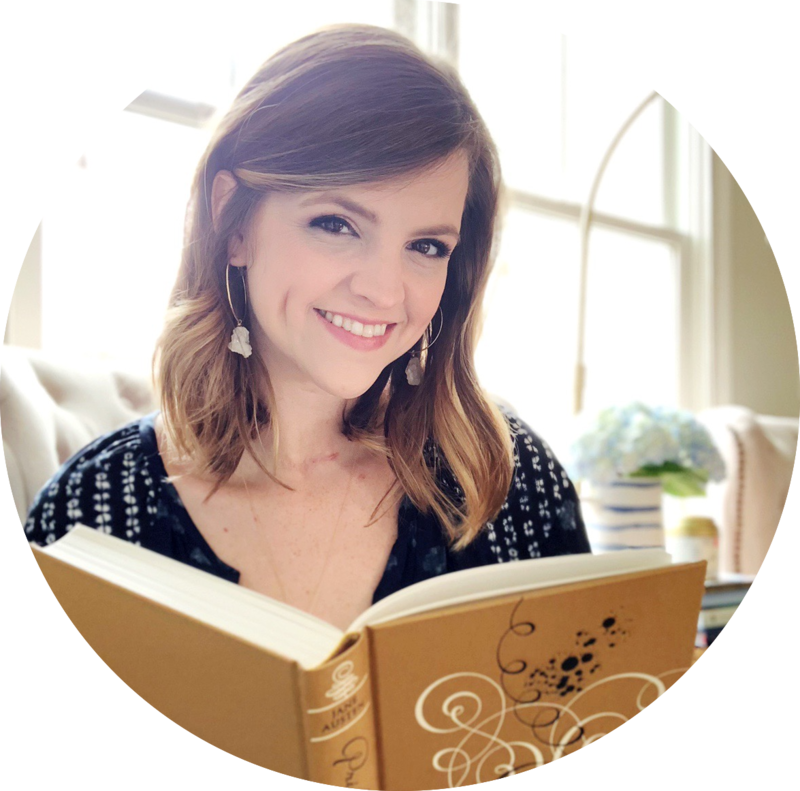 In case you missed it, I chatted about my gratitude journal, my daily planner, and my blogging planner and bookish printables. If you have any questions, just let me know! Whether it's tips for making your own printables or sticker book recommendations, I'm happy to help. 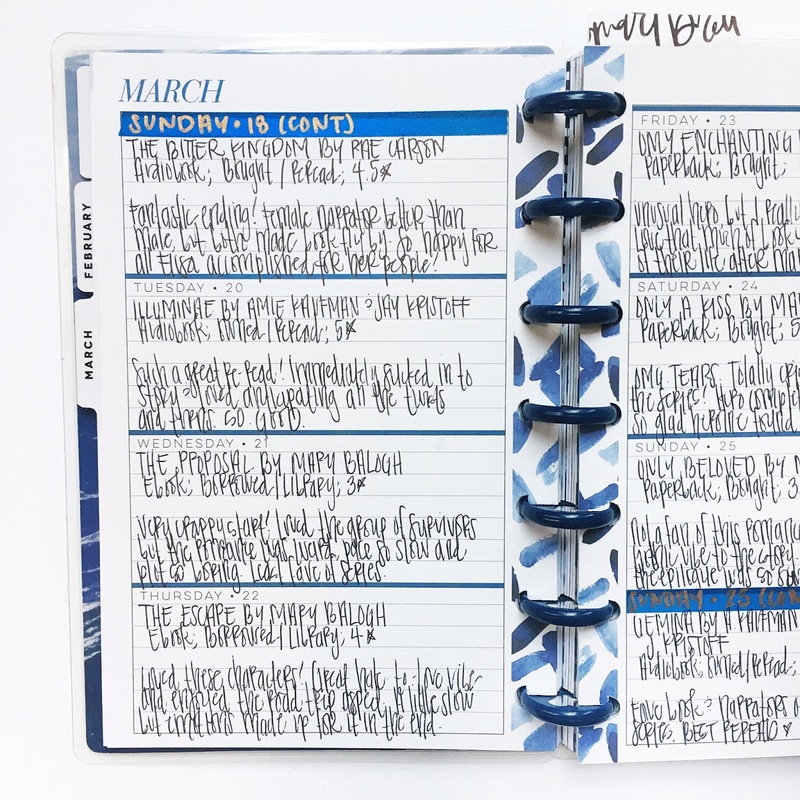 And if you've every written about your planner, leave a link in the comments. I'd love to check it out! 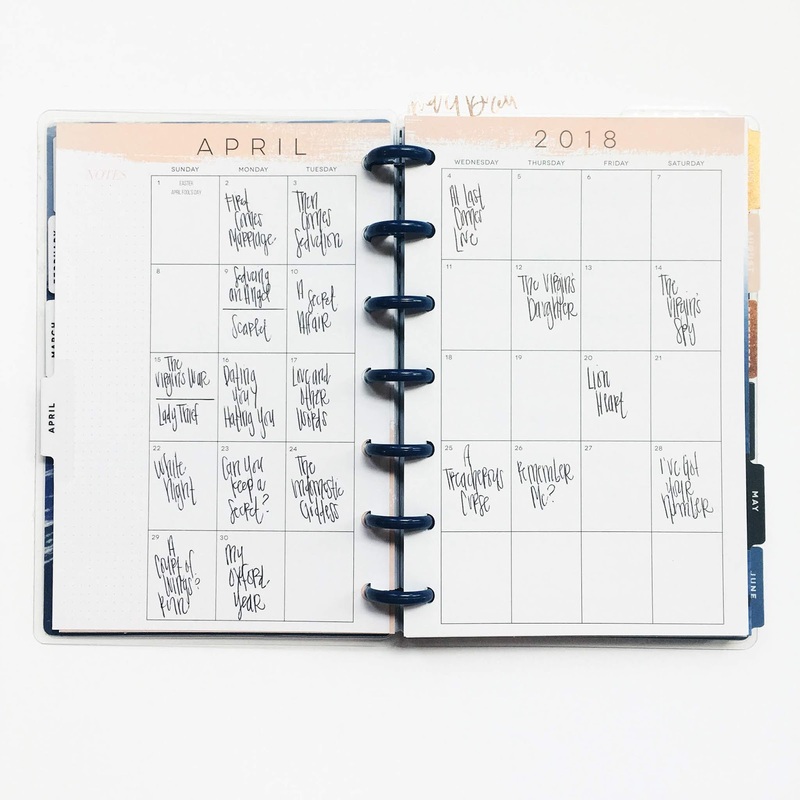 I've got a Happy Planner giveaway – with a bookish twist, of course – that will be going up on my Instagram account later today. I will come back on here and embed the post once it's live so you can see all the details! I have always had a love of journals and planners (and fresh school supplies), but I'm never very good at figuring out what to put in them. As a stay-at-home-mom of one, my calendar isn't that full of events. But I LOVE this idea of tracking your reading and books. I'm eager to try something like this out myself.